One of the main topics in understanding the effect of aerosols on climate is the investigation of the spatial and temporal variability of microphysical properties of particles. These parameters are, for instance, mean (effective) radius, volume and surface-area concentration, and complex refractive index. 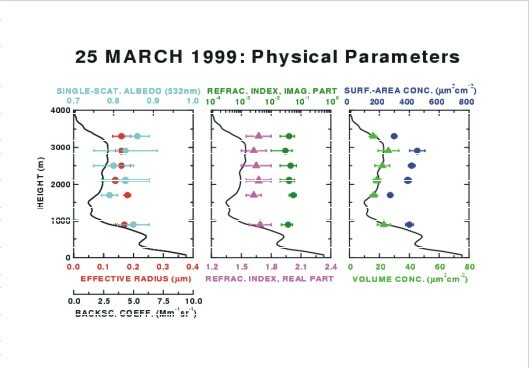 Single-scattering albedo which is one of the key input parameters in climate forcing studies is derived from such microphysical parameter sets. 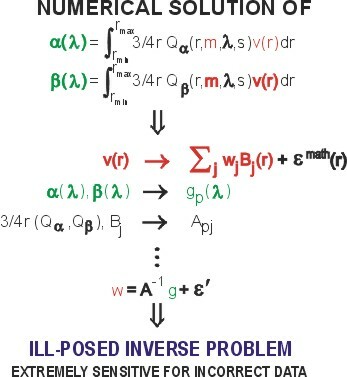 Data inversion algorithms are used to retrieve these parameters from the optical parameters which are derived from the lidar observations. 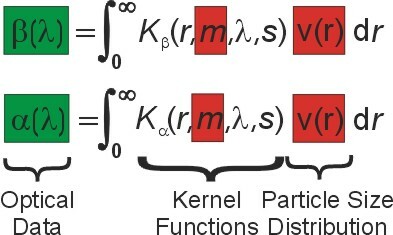 The difficulty in developing such algorithms lies in the fact that the input optical data are connected to the investigated microphysical parameters through non-linear integral equations of the first kind (Fredholm equations), which cannot be solved analytically. The numerical solution of these equations leads to the so called ill-posed inverse problem. Such problems are characterized by a strong sensitivity of the solution space toward uncertainties of the input data, the non-uniqueness of the solution space, and the incompleteness of the solution space. The solution space may still be correct in a mathematical sense, but might not necessarily reflect the physical conditions. Veselovskii, I., Kolgotin, A., Griaznov, V., Müller, D., Franke, K. and Whiteman, D. 2004. Inversion of multiwavelength Raman lidar data for retrieval of bimodal aerosol size distribution. Appl. 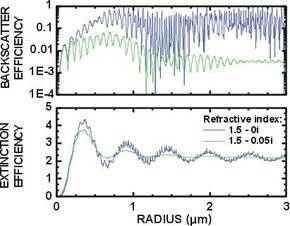 Optics, 43, 1180-1195. Veselovskii, I., Kolgotin, A., Griaznov, V., Müller, D., Wandinger, U. and Whiteman, D. 2002. 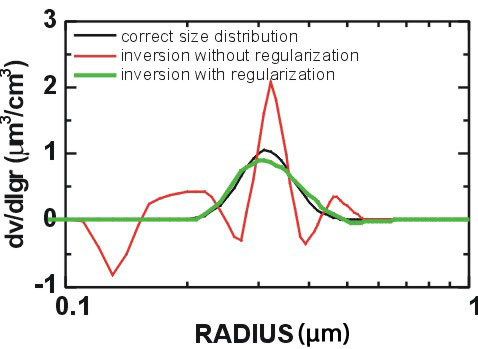 Inversion with regularization for the retrieval of tropospheric aerosol parameters from multiwavelength lidar sounding. Appl. Optics, 41, 3685-3699. Müller, D., Wandinger, U., Althausen, D. and Fiebig, M. 2001. 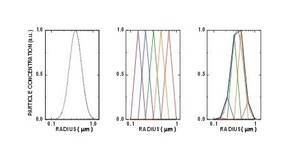 Comprehensive particle characterization from 3-wavelength Raman-lidar observations: Case study. Appl. 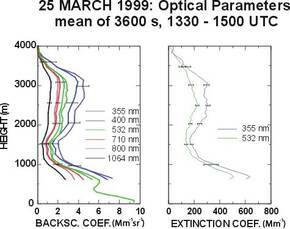 Optics, 40, 4863-4869. Müller, D., Wagner, F., Wandinger, U., Ansmann, A., Wendisch, M., Althausen, D. and Hoyningen-Huene von, W. 2000. 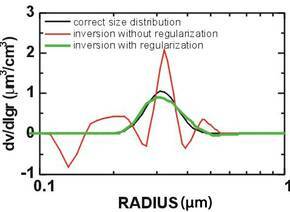 Microphysical particle parameters from extinction and backscatter lidar data by inversion with regularization: Experiment. Appl. Optics, 39, 1879-1892. Müller, D., Wandinger, U. and Ansmann, A. 1999. 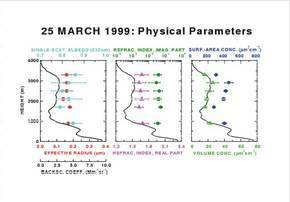 Microphysical particle parameters from extinction and backscatter lidar data by inversion with regularization: Simulation. Appl. Optics, 38, 2358-2368. Müller, D., Wandinger, U. and Ansmann, A. 1999. 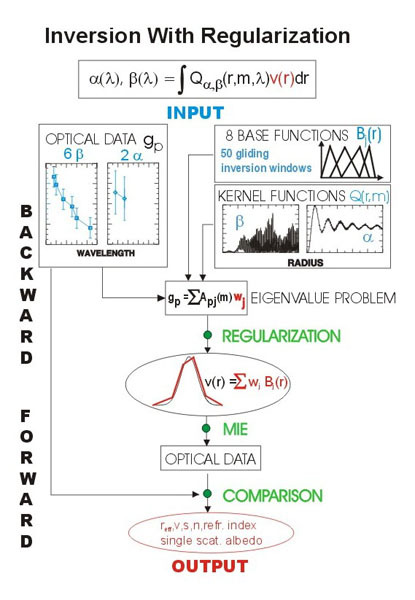 Microphysical particle parameters from extinction and backscatter lidar data by inversion with regularization: Theory. Appl. Optics, 38, 2346-2357. Müller, D., Wandinger, U., Althausen, D., Mattis, I. and Ansmann, A. 1998. 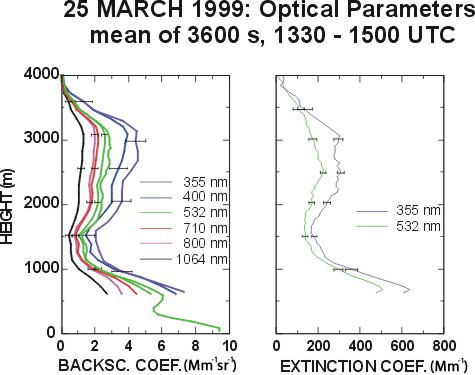 Retrieval of physical particle properties from lidar observations of extinction and backscatter at multiple wavelengths. Appl. Optics, 37, 2260-2263.